The law enforcement profession has felt some pretty strong earthquakes over the last year, and the Police Executive Research Forum (PERF) has been working to identify the lessons from which we can learn. PERF is a Washington, DC-based think-tank that conducts research and provides analysis of the myriad of complex issues facing the law enforcement profession. Over 2,300 police executives from every part of the country are members. Since September 2014, PERF has held three national conferences focusing on the upheaval that started with Ferguson. PERF reports on these meetings can be found on their website at www.policeforum.org. Recently I asked PERF to give me a summary of what police chiefs and other leaders have been saying at their conferences. Below is a summary of issues and solutions, many of which are already being implemented in some of our largest cities. In most departments, various aspects of force training are handled separately. Recruit training may begin with how to use a firearm. A month later, recruits are taught the legal issues, and weeks after that, they might receive training on de-escalation strategies. This fragmented approach makes it difficult to understand how the issues fit together. Furthermore, we need fewer lectures, and more “scenario-based” training, with role-playing exercises that mirror the incidents that actually happen – like a mentally ill person on a street corner, waving a knife. There’s also the issue of challenging conventional thinking. For example, in responding to a mentally ill person, it’s usually better to slow the situation down so officers can gain time to assess the situation, consider their options, and perhaps get additional resources on the scene. However, traditional law enforcement training generally encourages officers to move in, take charge of the situation, and resolve it without delay. And officers are sometimes evaluated according to criteria like how many calls they handle during a shift. We need to teach officers to understand that in many situations, the best approach is to slow it down. Rushing in can unnecessarily escalate the situation into one where a use of force is necessary. (1) provide a base level of crisis intervention training, perhaps 40 hours, to all officers. (2) create crisis intervention teams of law enforcement personnel and mental health workers. Team members would receive additional training, respond to the calls whenever possible, develop greater expertise, become familiar with the repeat clients, and help those people get the treatment they need. Many incidents involving mental illness are “suicide by cop” situations and these are tragic for everyone involved. By using de-escalation and crisis intervention strategies, officers will have a better chance of resolving the incident without hurting the suicidal person. Dispatchers play a critical role in giving responding officers a heads-up if there is any indication that a call may be a suicide-by-cop incident. These training approaches are not theoretical – many departments have already started to implement them. Kansas City, Los Angeles, Seattle, New York City, Las Vegas, San Diego, and Oakland are among the departments that are revising their training to include tactical disengagement, de-escalation, stress management during critical incidents, “emotional intelligence” (e.g., not taking it personally if a person on the street speaks to you disrespectfully), procedural justice, and other related issues. No question the United States has unique problems stemming from the easy availability of firearms. However, if we set aside incidents involving guns, and focus on incidents involving knives, screwdrivers, rocks, pipes, and other weapons, we can compare our experience to that of other nations. Consider the example of a person on the street, holding a knife and speaking incoherently. Police in the UK learn how to resolve these calls without using firearms. Only a few constables – 2 to 3 percent – carry firearms. Police in the UK have developed a “National Decision Model” that helps officers assess situations, evaluate threats, consider their options and their legal authority, develop a working strategy, take action, immediately review the results, and start the process over again if necessary. Every department must think through the policy considerations. 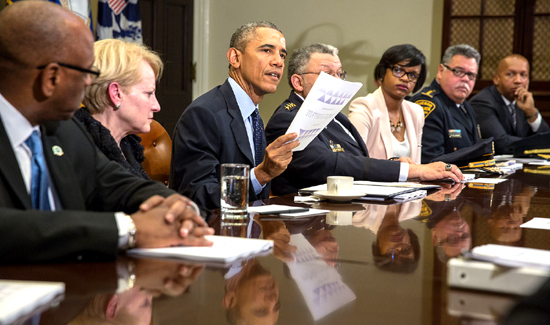 Body cameras alone are not the panacea for the issues that communities face. Simply passing cameras out to officers without developing policies and building community trust is short-sighted. The Police Executive Research Forum has developed guidelines for body cameras, which are available on the PERF website. Among the members of the Police Executive Research Forum, there is wide consensus that law enforcement must see themselves as part of the neighborhoods they serve. Transparency is important and recruiting and promotions should help ensure that personnel at all levels reflect their communities. Agencies should consider implementing training on “implicit bias” so their officers will better understand the biases that all people have. Departments should hire people who view policing as a vocation, not merely a job and agencies should have “duty to intervene” policies, because police-community relationships improve when community members see officers step in and stop misconduct by a fellow officer. And finally, the community must be involved in all reform efforts, because the community is the driving force behind solutions. Everyone benefits during a crisis if community leaders personally know members of their police department, and trust them to tell the truth about what is happening. It is important for police to build relationships over time, so they can work with community leaders during a crisis. If a police department is not part of the news media narrative in the first hours following a critical event, it loses the opportunity to present its perspective. Police agencies should release information as soon as they can – with the caveat that the first information is preliminary and may not always be correct. In my humble opinion, I think this research group needs guidance or involvement from law enforcement associations and unions. We represent all of our members not just Executive Staff. Our goals are also quality of services but officer safety and community involvement is also high on our list. A large amount of Law Enforcement Executive Staff Members are far from the streets and have no idea what modern law enforcement officers are dealing with daily. your all wet, I worked as an officer 40 years and proud of it, the federal programs we had then was non existent. I took mental health issues with people I dealt with them and they told me to turn them loose, did not have staff to deal with them or no money to treat them. federal programs did not work then and not now. we had out top citizens train on the police F.A.T.S systems which teaches the offices to identify a threat, assess the threat, then make the decision to fire on another person. this was a test every officer had to pass. our lovely high class citizens fired and killed everyone they saw. THEY FLUNKED and you want them to make decisions for officers now. have them ride with officer and get spit at, cussed at ,defend themselves from out lovely citizens who abuse out police officers. you might want to sit back and take a look at the lovely people attacking the police, they have NO CLUE.